From the outside you do not always see it on a wireless adapter, which features he mastered. There are already clear differences. WLAN adapters compliant with IEEE 802.11b and 11g standards are now outdated. You can still use them. However, you should not buy new ones. Currently, IEEE 802.11n and 11ac, which is perfectly sufficient for Raspberry Pi 11n. The transmission speed offered by 11ac can not be provided by Raspberry Pi's internal processing speed. The only question is how to find out the standard and features of any Wi-Fi adapter connected to a Raspberry Pi via USB. Identify the manufacturer of your wireless adapter. 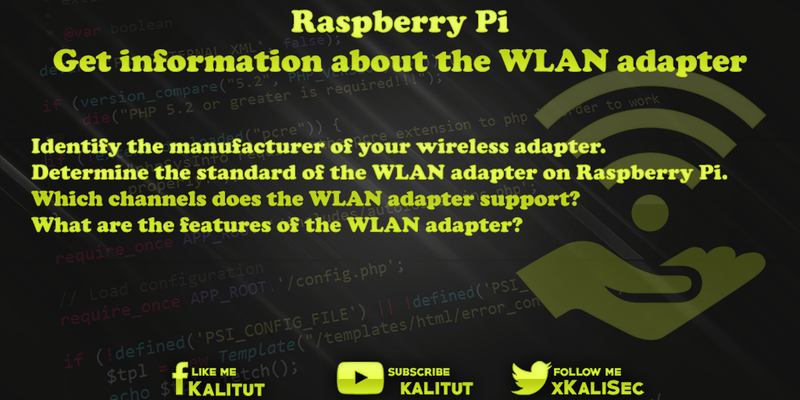 Determine the standard of the WLAN adapter on Raspberry Pi. Which channels does the WLAN adapter support? What are the features of the WLAN adapter? First, you should check whether the WLAN adapter is connected and logically integrated into the system. If there is no entry for "wlan0" here, you first have to worry about setting up the WLAN adapter. If you have ensured that the WLAN adapter is integrated into the system, maybe it also configured and a wireless connection is possible, then you can ever find the manufacturer. Here you will find information about the integrated hardware. Among other things, what was connected to the USB. Here should be something like "WLAN adapter" to be found. Mostly here follows the manufacturer and details of the chipset. Often these are Realtek and Ralink. If something like "IEEE 802.11bgn" is output, then you have the information about the standards supported by the wireless adapter. The channels in the frequency range of 2.4 GHz range from 1 to 11 in the US and from 1 to 13 in Europe. It is also different in other parts of the world. Of course, since you're dealing with Wi-Fi adapters that are made in Asia, it's of interest to see how much spectrum a specific Wi-Fi adapter is covering. This will give you a list of the channels (channels) that can be used and which channel is currently in use. For the interfaces "lo", "eth0" and "enx ...", of course, there is no frequency because they are not WLAN adapters.